Tigger and the "Cone of Shame!" 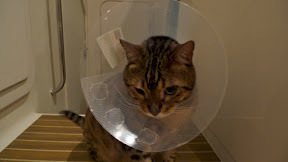 Tigger has had some treatment for a sore right eye today and has to wear the “Cone of Shame” for a couple of weeks. (“Cone of Shame”? See Pixar’s Up.) He’s feeling very sorry for himself. We’re stuck in Townsville until he’s declared fit and that will take 2-3 weeks. We’re still in the Breakwater Marina over the weekend but, after a check up on Monday, we’ll move out to anchor at Magnetic Island for a week until his next check up. We’re running so late that this puts the cruise in jeopardy. He may not be fit until mid November. Cyclone season officially starts November 1, although people seem not to be overly concerned until December. Last year, we left Lizard Island and started south on November 16th. However, this is a La Nina year and the cyclone season is expected to be more severe and maybe to start earlier. So, when Tigger is fit we have to make a decision. If the weather is favorable and there are no signs of cyclones, we head off north as fast as we can and get above 5 degrees south - to Rabaul in Papua New Guinea - where the cyclones don’t go. Otherwise, we head south as fast as we can to get down to Bundaberg or Brisbane. We spent another week in Butterfly Bay while the wind blew steadily 25+. When the wind shifted into the north we moved around to Nara Inlet in the south of Hook Island which is sheltered from that direction. 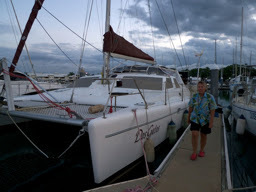 Finally, the wind eased and we left for Townsville on Sunday October 17th. As we’d wasted so much time in the Whitsundays, we sailed overnight and came into Breakwater Marina Monday afternoon. We rented a car and have been chasing around to complete the various errands on our list... a new pressure gauge for the compressor, a modified pulley for an alternator, groceries, etc. We also took Tigger to the vet as he has a sore eye. We plan to go out to Magnetic Island this weekend and then, once our forwarded mail has arrived, look to clear out next week. We have to sort out paperwork for Tigger with Quarantine too. Once the weather settled a bit we made our first scuba dives. Initially, we made two dives close to our Butterfly Bay anchorage - one in Maureen Bay and one in Manta Ray Bay. Then yesterday we motored to Hayman Island and made two dives there, one yesterday and one this morning. The dives were very similar - good coral and many fish, but poor visibility; perhaps 30 feet. Tomorrow, the wind is forecast to kick up again so we’ll go back to hide in Butterfly Bay. 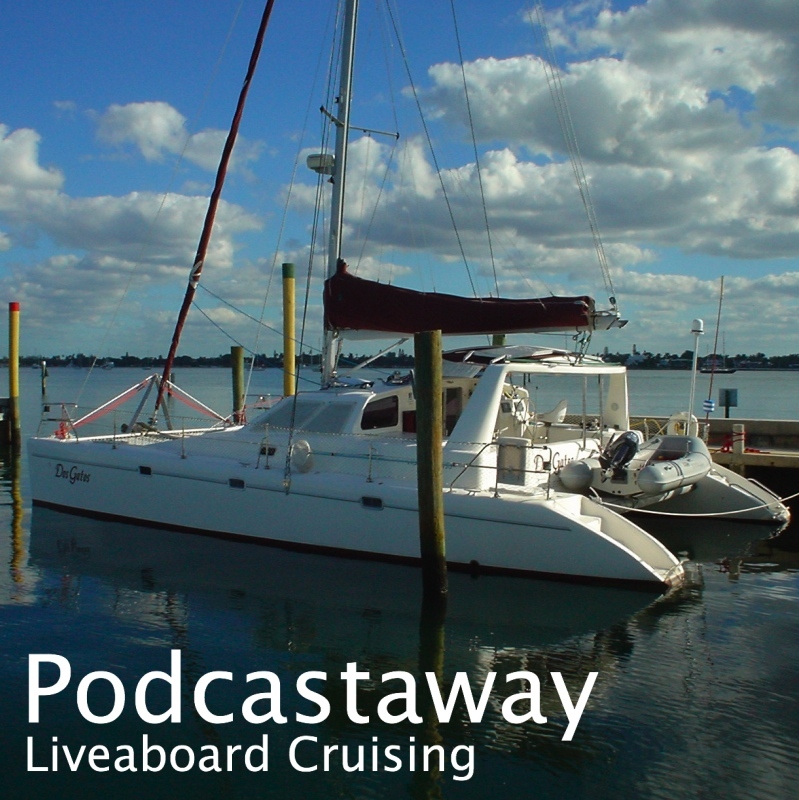 We stayed a few days at Lady Musgrave and then set off north on Sunday. We intended to travel overnight to the Percy Islands, a little south of Mackay. It was flat calm and we motored the whole away. Arriving at Middle Percy Island around 5pm Monday, we decided that the conditions were so calm that we should continue on. The weather was forecast to break in a couple of days. So we had another night underway - sailing this time - and got into the Whitsunday Islands on Tuesday. We first stopped at Whitehaven Bay as it was getting a little late to go on another 15 miles to Hook Island, but on Wednesday we arrived at Butterfly Bay on Hook Island - our favorite anchorage. Now the weather has deteriorated - it's blowing 20-30 knots - so we're hunkering down for the weekend.